The des file extension is associated with Corel DESIGNER developed and sold by Corel Corporation. The .des files contain technical illustration created with Corel DESIGNER. 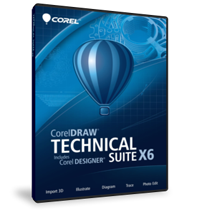 Corel DESIGNER Technical Suite (now know as CorelDRAW Technical Suite) combines the technical drawing tools of Corel DESIGNER with the graphic design power of CorelDRAW to give you a complete visual communication solution. Use Corel DESIGER to open and edit the .des file. You can also use CorelDraw vector graphics editor to open .des files. Use CorelDRAW to save the .des files to another format. Programs supporting the exension des on the main platforms Windows, Mac, Linux or mobile. Click on the link to get more information about listed programs for open des file action. Programs supporting the exension des on the main platforms Windows, Mac, Linux or mobile. Click on the link to get more information about Corel DESIGNER Technical Suite for edit des file action. Programs supporting the exension des on the main platforms Windows, Mac, Linux or mobile. Click on the link to get more information about CorelDraw Graphics Suite for import des file action. Programs supporting the exension des on the main platforms Windows, Mac, Linux or mobile. Click on the link to get more information about CorelDraw Graphics Suite for export des file action.